We love foyers that are filled with color and personalized accents. Your foyer is not just a welcoming transition into your home; with a little planning, you can give guests a preview of what’s inside. Even if your home doesn’t have a dedicated foyer, you can still create a designated space near your front door that is both beautiful and functional. If you use your side or back door more often, your foyer becomes a mudroom. Despite the name, this can be every bit as attractive as a traditional foyer — in fact, borrowing from the most useful features of a mudroom makes any foyer an essential space in your home. You should review your foyer needs before jumping into decorating. Make a wish list of what you’d like in your foyer and what is currently missing. For such an important space, function comes before design. If you walk in the front door every day and set down your keys and mail on a kitchen table, you’ll want to add a shelf or small table. If there is consistently a pile of coats and shoes on the floor, then it’s time to consider mudroom essentials like hooks and baskets. Once you identify what changes you may need to make to your foyer design, it’s time to focus on color and decor. Here are some of our favorite ways to add color and style to your foyer. The good news about your foyer color palette is that it doesn’t have to be exactly the same as your living room. Like powder rooms, guests expect the foyer to be a little more over-the-top when it comes to color and design. Your color palette should include a color or two from your living room to tie everything together, but it’s okay to bring in additional colors that you love. If you do stick with living room colors, go a shade (or two) lighter or darker to get a more customized look. Your foyer may not have an obvious focal point, but the right wallpaper can create one. Foyers are often small, so wallpapering one accent wall may be enough to decorate without overwhelming your space. Today’s wallpapers are available in every popular style. Temporary wallpapers make it easy to experiment with the idea of wallpaper without a long-term commitment, especially in a rental home. Most people forget to add a rug to their foyer, or they grab a doormat from the store without putting much thought into it. Your foyer rug should be functional, so that you aren’t tracking dirt into your home, but it should also be gorgeous. An indoor/outdoor rug could be the right solution for blending style and function in an active home. We love the (almost) unwritten rule that foyer lighting should be fabulous. 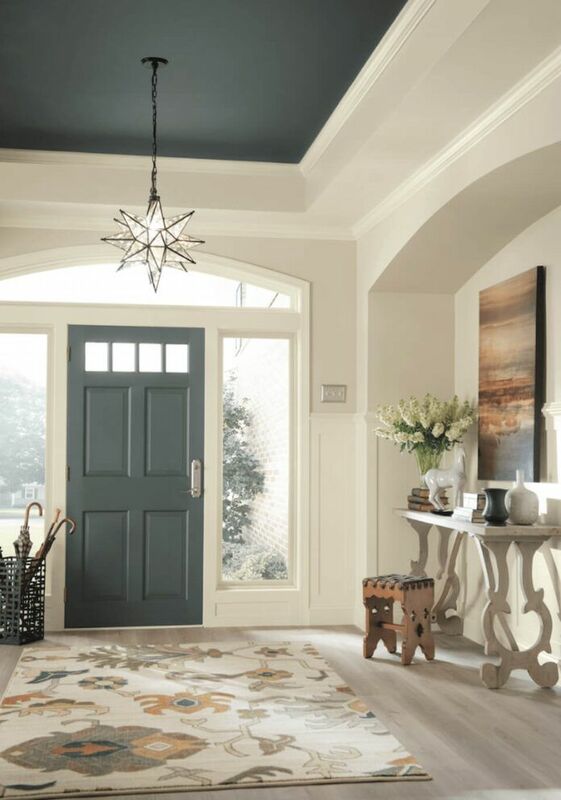 Your foyer is the perfect space for a special light fixture. If you have the ceiling height, then a chandelier is a great fit. A chandelier doesn’t have to be extravagant; however, it should be more dramatic than your other lighting while staying true to your home’s decor. Not all foyers and entryways have soaring ceilings. A flush or semi-flush light fixture can be every bit as stylish as a chandelier. Wall sconce fixtures are also good options for low-ceiling rooms, or for adding more light to a dark space. Your foyer may be doing double-duty as a mudroom, or you may just need more storage solutions. Wall hooks and shelving keep coats and shoes from landing in a heap inside your front door. If you’re a “shoes-off” home, be sure you provide a place to sit and remove shoes easily. A bench with baskets underneath serves two purposes with seating and storage. Add colorful cabinets and accessories to personalize your mudroom/foyer and balance the practical needs of the space. Foyers serve as a crucial welcome point to your home. With some thought and careful design, a colorful foyer invites guests in and adds style to your home as a whole. Have you used color in your foyer to create an impact? We’d love to hear about it below! The post Why Your Foyer Needs Color (And How to Choose It) appeared first on Freshome.com.